My good buddy Josh Landon made up a character. All we knew about him was that he was a duck and his name was Mr. Jonathan. So, we went where our generation goes when faced with unanswered questions - google. 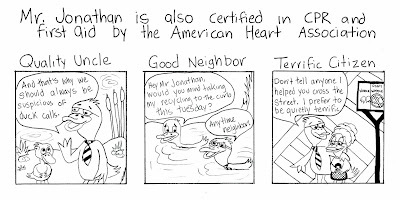 We googled "Mr. Jonathan is" and whatever sentences came up have become the titles for the various strips. Writing and art were a collaborative effort and we're learning more about Mr Jonathan every day. click the image to enlarge it! I never thought I'd use 'blog' as a verb in earnest, but look at me now.